Azhagi+ (AzhagiPlus) is a lightweight program for transliteration supporting in 16 Indian languages/scripts including Tamil, Hindi, Sanskrit, Telugu, Kannada, Malayalam, Marathi, Konkani, Gujarati, Bengali, Punjabi, Oriya, Sourashtra, Assamese, Devanagari and Grantha. The program can be extended to support other languages. How to extract: Download the "portable" ZIP package and extract to a folder of your choice. Launch Azhagi-Plus.exe. It is worth mentioning that this software is also present on Android operating system. Don't you think the entry needs to be cleaned up a little? I'm thinking of categories, bold typeface and hyperlinks. RapidTyping is a teaching tool for both adults and kids to use a keyboard more efficiently. Unicode support: Yes. Options->Font. Custom the lesson and keyboard fonts. Support Unicode fonts. I don't use Unicode fonts, but it's been available since 3.4. TYPETEST will help anyone at any level to improve on their typing speed. It includes both short and long word lessons, along with configurable lessons. It can load any .TXT file (three are provided.) Additional spaces are omitted for the tests. The tests can be spoken by the PC. How to extract: Download the ZIP package and extract to a folder of your choice. Launch Typetest.exe. 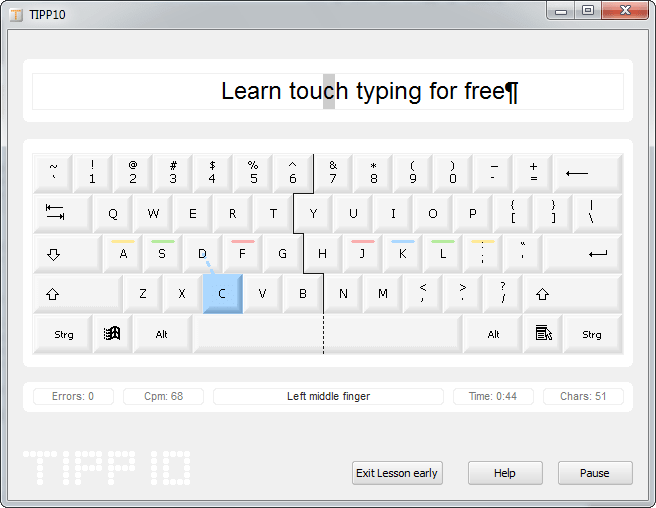 TIPP10 is a free touch typing tutor with an extensive progress tracker, numerous training lessons and the ability to create your own. Characters that are mistyped are repeated more frequently. Also available in PortableApps.com format. How to extract: Download the "portable" ZIP package and extract to a folder of your choice. Launch tipp10.exe. Limited keyboard support, directed mainly to German Speaking users. I've used this years before but after re-checking it I was kind of surprised there was no WPM (Words Per Minute) counter anywhere, instead only CPM (Characters Per Minute) is listed. Have read elsewhere that WPM is CPM/5 but it would be preferable to be displayed within such a program. Stamina is a multifunctional touch-typing tutor with support for several Keyboard layouts and languages. Lessons designed for mastering certain keys. Use text from an external file, lesson editor. Precision clock &amp; Timer. Progress graphs by days and sessions. Statistics: Keystrokes (in Kb) &amp; duration. Illumination of letters and finger work zones on the virtual keyboard. MP3 background + a Playlist. Customizable appearance.